Users are the representation of an Azure Active Directory (Azure AD) work or school user account or a Microsoft account in Microsoft Graph. The user resource in Microsoft Graph is a hub from which you can access the relationships and resources that are relevant to your users. 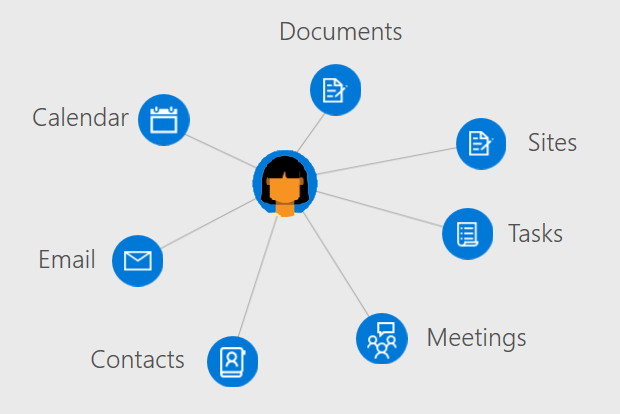 You can use Microsoft Graph to access the relationships, documents, contacts, and preferences that are contextually relevant to the signed-in user. The user resource provides straightforward way for you to access and manipulate user resources without having to perform additional calls, look up specific authentication information, and directly issue queries against other Microsoft Graph resources. To access a user's information and data, you'll need to get access on their behalf. Authenticating your application with admin consent enables you to work with and update a wider range of entities associated with a user. Create or delete users in your Azure AD organization. List a user's group memberships and determine whether a user is a member of a group. List the users who report to a user and assign managers to a user. Upload or retrieve a photo for the user. List and create events on a users calendar. View tasks assigned to a user. Find free meeting times for a set of users. Get a list of reminders set on a user's calendar. List mail messages and send new mail. Create and list user contacts and organize contacts in folders. Retrieve and update mailbox folders and settings. Return documents recently viewed and modified by a user. Return documents and sites trending around a user's activity. List documents shared with a user through email or OneDrive for Business. Learn more about how to work with users. Explore your own data from the user resource in the Graph Explorer. Authenticate with Microsoft Graph on behalf of a user or as a daemon or service by consent of an administrator. Set access control and policies for users with the Azure AD API. Review the permissions your app will need to access user data.